This Adult Felt Musketeer Hat w/ Feather puts the finishing touches on your look. The feather gives it an especially jaunty appeal! 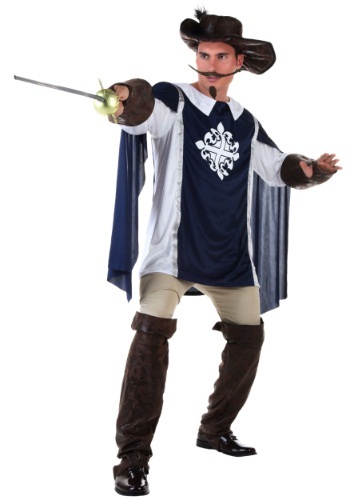 Show off your strength and skill to your fellow musketeers when you wear this Brave Musketeer Costume! The ensemble includes a tunic/shirt combo, gauntlets, a hat, and boot spats. Wear it with your own black pants, or buy ours. Add a fake mustache & beard and musketeer sword to finish off the look. Did you know that there were actually FOUR musketeers? The Alexandre Dumas novel tells the story of a young man who meets three musketeers and is determined to join them, which he eventually does--making four. He's been practicing his fencing skills and now he's ready. 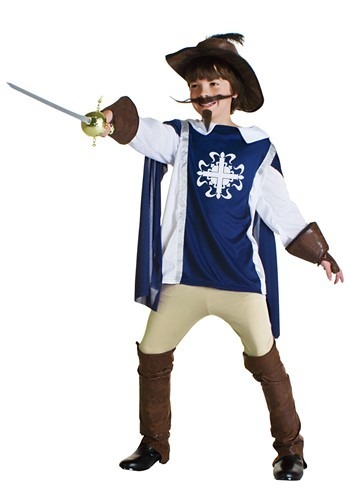 Join your buddies and fight the way they did in earlier times when you wear this Child Musketeer Costume! Wear it with your own pants and add a toy sword. Daring sword fights! Romance! Adventure! Does the mere thought of those things get your blood pumping? Is your brow damp with sweat? Are you doing fake fencing moves with your broom right now? 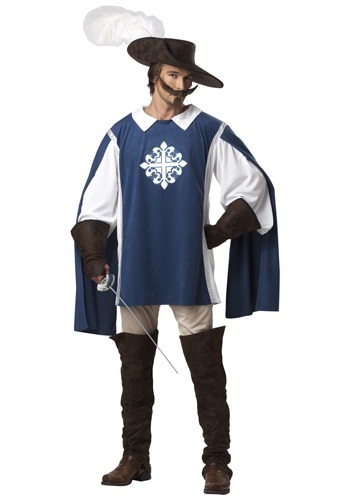 If you answered "yes" to any of these, then this Men's Brave Musketeer Costume may be what you''ve been searching for. It has the look of a classic French swordsman that may just make you feel like changing your name to D'Artagnan and it makes you look like less of a weirdo when you practice your fencing techniques in the living room. (Use the a meter stick next time. It makes a way better pretend sword than a broom). 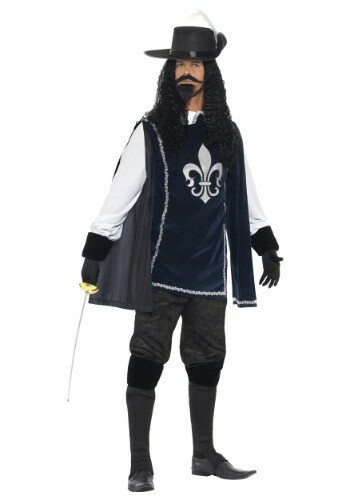 It'll be "all for one and one for all" when you wear this Men's Musketeer Costume. You can become one of the main characters in the Alexandre Dumas novel, The Three Musketeers. You can add a sword to this costume and black boots to look more like one of the classic characters. 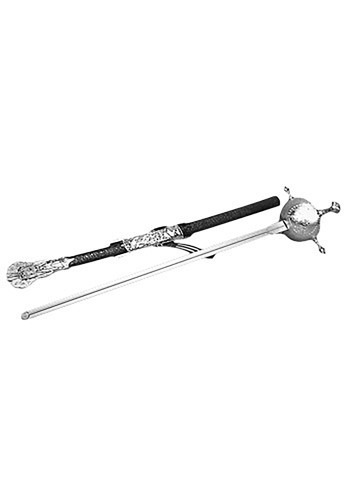 Defend yourself along side your fellow musketeers with this musketeer sword. This toy weapon has a shiny gold colored handle and a narrow grey blade. It the scabbard can be attached to a belt in order to keep your weapon handy at all times. All for one, and one for all! You'll be all set to explore the globe with Ponce de Leon in perfect style. 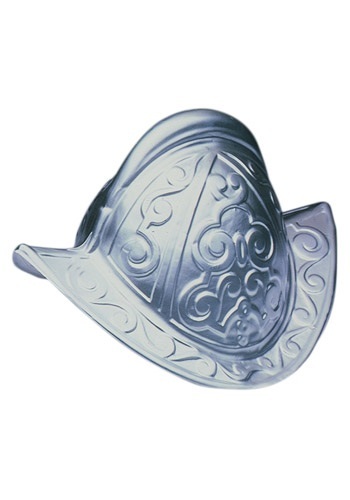 Complete your adventurer costume with this plastic Conquistador helmet. Got two buds? A betting man would wager that the three of you would look exceptional decked out in Musketeer gear! The Three Musketeers are just one of those iconic group costumes that are never out of a place at a Halloween party. Add our (plastic) musketeer sword and you can safely duel the night away! 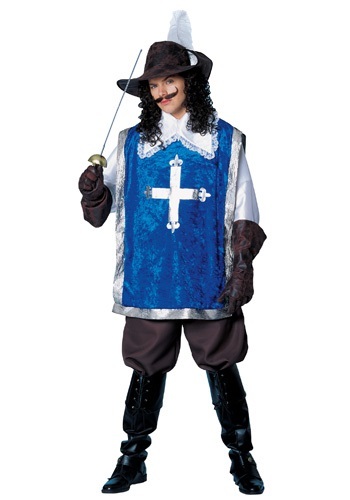 The men will be "all for you" when you wear this Women's All For You Musketeer Costume! Form your own troop of Musketeers of the Guard and protect the Ancien Regime. Or just have a good time at a costume party! NOTE: hat, sword & boots sold separately. It will be one for all and all for one when you wear this Women's Musketeer Hat! That doesn't mean you'll all be able to wear the one hat, though. You'll need one for each of your friends.